Established in 1969, the Family Medicine Residency at Hennepin Healthcare remains at the forefront of primary care. Residents gain immediate, hands-on experience working with a diverse patient population at our state-of-the-art Whittier Clinic, a LEED-certified building that opened in 2010. Every day, residents use the latest technology and learn from staff and specialists who are dedicated to teaching. Our program features opportunities in holistic and integrative medicine, women’s health, sports medicine, geriatrics, and international health, all under the guidance of expert faculty. We emphasize resident leadership and a multidisciplinary approach that builds strong, collegial relationships at all levels. Our graduates develop clinical expertise, effective communication, leadership skills, and practical management techniques. Many pursue fellowships or accept teaching faculty positions across the country. Family Medicine residents enjoy a weekly academic half-day (five hours) of protected time to focus on didactics, procedures, and research. Resident wellness and resilience is a top priority, and our curriculum incorporates stress management, mind-body medicine, and other holistic techniques across rotations. Well developed Health Care Home program launched and accredited in 2011 by the Minnesota Department of Health. Procedural training in OB-GYN procedures, skin biopsies, colposcopies, sports injury casting, and more. Certification in Integrative Medicine using curriculum developed by the University of Arizona Fellowship in Integrative Medicine. Multifaceted Centering Pregnancy model for group prenatal care, designed to lower pre-term birth rates. Urban and rural rotations, with opportunities for international rotations. View a blog from one of our residents, Dr. Justin Corbin, about his international rotation in Samoa. What is the "community" in Community Medicine? All of our residents connect with the community we serve by adopting a community organization and developing a service project that spans the full 3 years. Our longitudinal geriatric curriculum prepares our graduates to provide the highest quality care for older patients—an important skill, as more than 20 million adults over age 85 are estimated to need medical care by 2050. Through traditional coursework and direct patient care, residents learn to address the issues inherent in geriatric care. Beginning in the Family Medicine outpatient clinic, residents care for their own panel of older patients, with faculty assistance. Geriatric patients also comprise a significant portion of inpatients on the Family Medicine Inpatient service. Residents see firsthand the issues for patients and families in caring for the elderly, including end-of-life decisions. Residents also provide continuity care for patients at a local nursing home during PGY-2 and PGY-3. We complement these hands-on clinical experiences with interactive, small-group teaching sessions by our faculty members who are board-certified in geriatric care. At the end of PGY-1, residents can opt for additional, focused training in Geriatrics outside the core curriculum, using a longitudinal approach during their PGY-2 and PGY-3 years. These residents take on additional geriatric rotations and gain experience in nursing home administration, hospice, and palliative care, and the skills needed to provide care to ambulatory older patients. We deliver this structured curriculum in the principles of health care homes throughout the Family Medicine residency, using didactics and experiential learning for patients with complex care needs. Residents learn leadership skills, participate in multidisciplinary teams in both inpatient and outpatient settings, and train in complex care management. The demand for integrative primary care physicians today exceeds capacity—across the Twin Cities, the state of Minnesota, and the nation. The Family Medicine residency is one of the few training programs nationally that give residents practical experience in this discipline. Our Integrative Medicine curriculum prepares residents to practice basic integrative medicine, continue lifelong learning, and become integrative medicine leaders in their healthcare practices. The entire Family Medicine curriculum incorporates principles of Integrative Medicine. Each resident participates in 200 hours of online training through the University of Arizona. Residents also participate in bi-monthly wellness and self-care lectures and experiences. At the end of PGY-1, residents can opt for additional, focused training in Integrative Medicine outside the core curriculum, using several formats and modalities during their PGY-2 and PGY-3 years. These residents will spend three sessions in clinic each week caring for patients with trained integrative health faculty, 2-3 weekly sessions in personal study and self-care, and log five integrative health primary care encounters outside the focus area. Implementing integrative medicine longitudinally in their primary patients. Delivering a journal club lecture on an integrative health topic. All residents rotate in the Whittier Clinic procedure clinic, held twice each week. Residents perform joint injections, basic and advanced skin procedures, vasectomies, and other procedures. Within our sports medicine curriculum, residents learn from faculty with additional sports medicine training and rotate in the sports medicine clinic at our Whittier Clinic location. During PGY-2, residents participate in a didactic course at the University of Minnesota. Residents also act as team physicians for local high schools. We offer a wide variety of elective opportunities, encompassing any specialty clinic located at Hennepin Healthcare. If you do not find what you are looking for, our residents are able to create their own elective, under faculty guidance, to design a learning experience specific to their interests. Additionally, we have ongoing relationships with international sites in Tanzania and the Philippines, or residents may pursue opportunities abroad that they have researched on their own. Family Medicine residents enjoy a weekly academic half day of protected time (five hours) to focus on didactics, procedures, and research. Our program features a strong emphasis on obstetrics, and the inclusion of integrative medicine, geriatric care, and home health care principles across the curriculum. 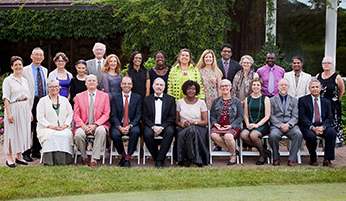 Seventeen core faculty lead the Family Medicine residency, each focused on a specialty area, including geriatrics, integrative medicine, sports medicine, and international health. Many are nationally recognized leaders in their fields with extensive clinical and academic healthcare experience. More than 70% of our teaching faculty completed Faculty Development Fellowships at the University of Minnesota, and all hold university appointments. The first year of the Family Medicine Residency program prepares residents for inpatient medical and emergency care, including obstetrics and pediatrics, and sets the groundwork for essential outpatient skills and practice. Our residents work collaboratively with other Hennepin Healthcare residency programs, building relationships and taking advantage of broad educational opportunities within our healthcare system. Family Medicine residents also teach medical students on the inpatient service. The inpatient Family Medicine Services includes adult, pediatric, and obstetric patients from our own practice at Whittier Clinic, as well as patients from three additional Hennepin Healthcare primary care community clinics. At Whittier clinic, G1 residents develop skills in outpatient primary care as they build their own practice panel. We use the “Clinic First” model which prioritizes continuity in the clinic by maintaining a stable clinic day that patients and residents can rely on. Orientation occurs weekly during the first two months of training. During this time, residents participate in team-building and skill-building activities and learn essential skills for integration into the residency program. PGY-2 residents take on a leadership role on the inpatient Family Medicine Service, monitoring the work of interns, and medical students and supervising the care of all inpatients under the guidance of faculty. Outpatient experiences are set at Whittier Clinic, as well as at Hennepin Healthcare’s specialty clinics, and include dermatologic, orthopedic, and gynecologic procedures as part of everyday practice. Our Preventive Medicine rotation highlights the year, where residents get personalized one-on-one teaching in clinic and spend one week at the Hazelden Addiction Treatment Center. Ambulatory experiences include work at the Whittier procedure clinic, where residents learn procedures common to family medicine. During PGY-2, residents begin a longitudinal experience at Chateau Nursing Home, developing continuity relationships with geriatric patients. Most residents will also begin their Centering Pregnancy groups in the second year. Our third year focuses intensively on continuity clinic practice at the Whittier Clinic location. Residents build their knowledge and apply their skills to care and management of patients with complex healthcare needs. Outpatient rotations take advantage of Hennepin Healthcare’s various specialty clinics to address common primary care problems, such as rheumatology, geriatrics, ENT, cardiology, gynecology and urogynecology, outpatient pediatrics, and adolescent medicine. Residents maintain their inpatient skills with two months as the senior resident on the Family Medicine Service, with additional responsibilities for teaching and supervision of PGY-1 residents and medical students. One of the gems of our program, our team of Family Medicine residents and faculty run an independent, inpatient service drawing patients from 4 Hennepin Healthcare community clinics. We care for pediatrics, adult medicine, obstetrics and newborns and actively manage all inpatient care plans, consults, and discharge planning. Although our residents take primary responsibility for patient management, we have in-house faculty 24 hours a day for back up and teaching. Family Medicine residents gain valuable experience with low- and high-risk pregnancies during their rotations. Residents rotate through one block under guidance of the OB department, with opportunities for managing obstetrics on all FMS blocks (total of 7) and during night call. Residents have opportunities to perform all OB procedures, including vacuum-assisted deliveries, and manage laboring patients with preeclampsia, preterm deliveries, and gestational diabetes. All Family Medicine inpatient faculty practice obstetrics and several serve on multi-disciplinary committees to help foster better communication and patient care. Five faculty members are Advanced Life Support in Obstetrics (ALSO) instructors, including one nationally recognized ALSO Advisory Faculty. Each resident takes the ALSO course in PGY-1 and again in PGY-2 or PGY-3 to enhance their skill and improve confidence when handling labor and delivery emergencies. Our residents have successfully managed dystocia and postpartum hemorrhage, and routinely cite the ALSO course as increasing their ability to manage these situations. Another highlight is training in Centering Pregnancy. All residents have the opportunity to co-facilitate their own prenatal group to learn this care model that has proven effective in lowering pre-term birth rates. Our training includes a wide variety of experiences in Pediatric care. Including 2 inpatient rotations at Hennepin Healthcare and one at Minneapolis Children’s Hospital, and a dedicated rotation in the Pediatric ED. In the outpatient world, we offer a specific rotation with focused learning in both general and adolescent Pediatrics, Centering Parenting group visits as well as a robust pediatric population in the Whittier clinic. On the inpatient medicine service, our residents learn alongside several other programs as fully participating members of the team and complete an MICU experience in the G2 year. Including three or four letters of recommendation, with one from a US clinical supervisor. This requires passage of all components of the USMLE within a seven-year time span, from the first attempt of USMLE through successful completion of Step 3. Our program prefers first time pass on the USMLE steps 1, 2, and requires first pass on CS. We give preference to graduates with a minimum score of 215.
International medical graduates must submit passing Step 1, Step 2, CS and Step 2 CK scores before their applications will be considered. USMLE Step 2 or COMLEX Level 2 exam results are not required for current medical students but preferred for interview selection. Please submit scores as soon as they are available to be considered for ranking by the rank list due date (mid-January for AOA Match and mid-February for NRMP Match candidates). Citizenship, permanent residency, or ability to obtain a J-1 visa. Qualified to begin work by mid-June of residency start year. Eligible applicants will be contacted to schedule interviews starting in October on a rolling basis as applications are reviewed. However, due to the high level of interest in our program, we are not able to interview all applicants. Interviews are required for admission to our program. We plan your interview experience so that you will have the opportunity to meet program leadership, other faculty, residents, and have an opportunity to tour the community, hospital, and our clinic. We encourage you to arrive the day before your scheduled interview as you will be invited to join several residents for a meal and a tour of the community. On the formal interview day, you can expect to be engaged from 7:30AM – 3PM. You are welcome to bring your spouse or significant other. Please inform our residency coordinator if you plan to do so. The Family Medicine Residency at HCMC is ACGME accredited. Residents treat a cross-cultural population with a wide variety of illnesses and issues, from diabetes and sports injuries to obstetrics and tropical infections. All residents develop a long-term relationship with a community organization and partner with them over the three years to complete a project to get hands-on learning experience in community relationship building. Strong inpatient and outpatient training. Residents develop essential skills to manage hospitalized patients and help them transition to ambulatory settings as well as quality initiatives in the outpatient clinics. Our integrative medicine curriculum focuses treatment on the whole patient and demonstrates how to incorporate holistic concepts into regular practice. Outpatient training focuses on acupuncture, physical therapy, behavioral health and chiropractic care. Hennepin Healthcare operates a paperless environment, with Epic integrated electronic health records available in all locations. Our clinics feature the latest equipment, with access to additional services on the main HCMC campus. 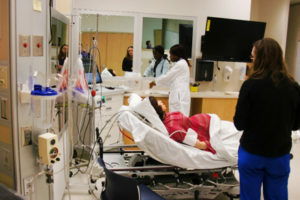 Residents train for real-life scenarios in our simulation and education center. Our residents work and learn within family medicine, function as interns for cardiology, pediatrics, surgery, and other specialties. As an academic system, teaching and research are priorities for all attending physicians. Whittier Clinic serves as the main site for family medicine residents. Whittier Clinic provides immediate, on-site access to everything from x-ray, ultrasound, and laboratory services to a dedicated support staff of social workers, physical therapists, interpreters, and other professionals. This high-tech facility enables us to deliver outstanding preventive and primary care, and perform many outpatient surgical procedures, all within the Minneapolis neighborhood we serve.